Things have changed a lot since I started working in the woods in 1975. 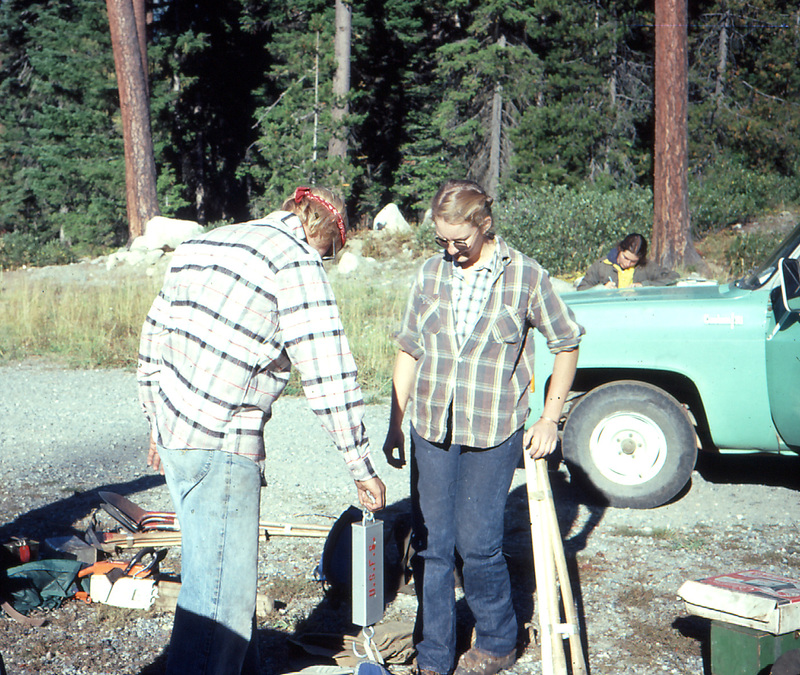 Back then, we wore levis and flannel shirts and waffle stompers. My first backpack had a metal frame, and the bag was attached with all sorts of hardware. Fiberfill sleeping bags were relatively new, and quite heavy. These days, there are new materials and designs to make life in the mountains much more comfortable and convenient. Gear is lightweight and durable (mostly). Being on the trail crew means we put things through rigorous field-testing. Here are some recommendations. Clothing: Carhartt work pants are favored. They hold up pretty well. We wear long-sleeved shirts (protection from sunburn, scratches, pitch, bugs). I like ones made out of wicking material–they dry quickly and have proven to be durable for many seasons. They don’t rot as fast as cotton. Rain gear is problematic. The good Gore-tex stuff is expensive and fragile. Cheaper rain gear doesn’t work when you’re thrashing through wet brush, and also tends to fall apart (you can do a quick fix with duct tape). Heavy rain gear isn’t light and packable. Since you’re probably not going to stay dry, the next best thing is to stay warm, and that means layers. I am a poster child for Smartwool. I love their lightweight underlayers, and have a bunch of the long-sleeved quarter zip tops. Their trekking socks are the best. I also carry a lightweight fleece top in my pack for an extra warm layer. As for accessories, everyone should carry at least one bandana and a light warm hat, either wool or fleece. Light warm gloves are good to have too. We buy leather work gloves in bulk for the whole crew. I never go to work without my Leatherman tool attached to my belt (even though it may be nerdy-looking, you never know when you might need a screwdriver or pliers). Boots: Could take up a whole page. Trail work requires a leather lace-up boot with a lug sole. Nothing else stands up to the hiking and the work. Feet are tools as well as a means of locomotion. New to me this year is a pair of Asolo 520s. So far, so good. Other brands I have worn out are Zamberlan, Lowa, Alico, Vasque, Montrail. None of them have been as durable as I would have liked, and some of them didn’t fit very well. As we like to say, “Take care of your feet and your feet will take care of you.” I’m a huge fan of the Peet bootdryer. Gone are the days when I stuff my feet into boots that have been wet for three days (except on those camping trips to Lemah Meadow). Packs: The current recreational pack trend is toward streamlined and lightweight. Not conducive to carrying a gallon of water, handheld radio and spare battery, a 3 1/2 pound felling ax, and a bunch of other stuff you need to do the work. We field-tested Gregory day packs and they fell apart after two seasons. I’m back to using my old Kelty Moraine, but it’s less than ideal. For multi-day trips I use a Bergans Trollhetta, and am really happy with it. Most comfortable and versatile backpack I’ve ever had. I use a Camelbak hydration system. It has proven to be the most durable of all the ones I’ve tried, and it’s easy to get parts for. Better to keep drinking water than to keel over from dehydration and/or heat exhaustion–been there, done that. Camping gear: The crew has a mishmash of stuff. We all love our Thermarest sleeping pads, which convert into camp chairs. We use MSR water filters, although they’re kind of heavy. We tend to go with MSR gear when we can. I love my Snow Peak stove and titanium cook set. Go to Olympia and shop at the Alpine Experience. They have Bergans pack and other good stuff as well as honest and knowledgeable staff. Highly recommended.